Aboard Scripps Oceanography research vessel Robert Gordon Sproul, two University of California San Diego undergraduate students hold taglines as engineer Matt Norenberg and marine research technician Matt Durham assist in deploying an ocean bottom lander from the lab of marine microbiologist Douglas Bartlett. Photo by Kelli Mullane, one of Bartlett's graduate students. The autonomous Leggo Lander was deployed during a recent engineering test cruise in the San Clemente Basin. 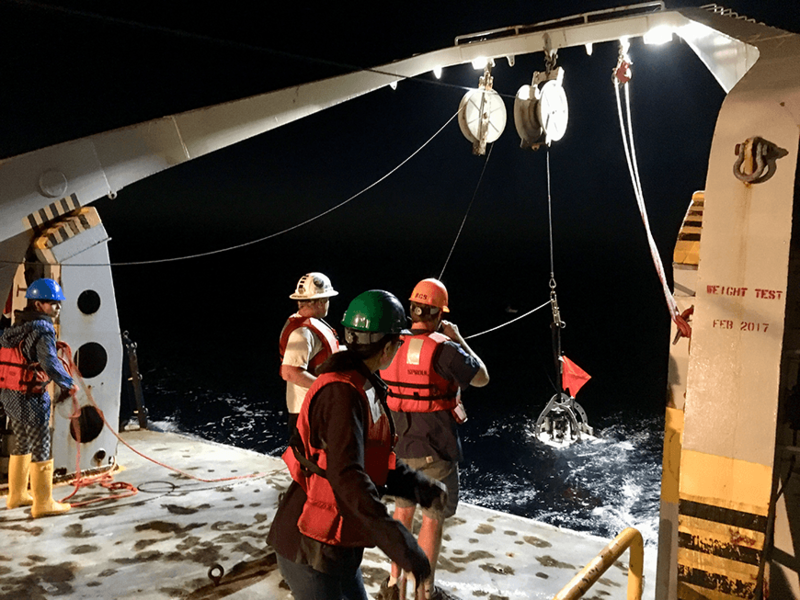 The Bartlett Lab studies microorganisms from deep-sea trenches to understand the adaptation of these microbes to the extreme environmental cold and pressure found in the deep. "The lander is sent down to the bottoms of trenches using weights," Mullane writes. "Once the lander sits on the bottom and collects the desired samples, the weights release and the lander floats back to the surface and we go find and recover it. The pressure retaining sampler allows us to maintain our water samples at in situ pressure." And that will enable the lab to study pressure-sensitive microbes that otherwise wouldn't survive the trip back from the ocean depths. Bartlett plans to use the lander's instruments in deep-sea trenches around the world.